As regular readers will know, I'm a huge fan of Continental Knitting and I've written about it numerous times already. If you missed my previous posts about why I learned to knit this way, and the impact it's had on my speed, comfort and productivity, you might like to read The best (knitting) thing I ever did, Things I didn't know about knitting and On ambidexterity. When it comes to Continental Knitting there's only one overarching rule: fewer motions mean more efficiency. During class, learn which motions have the greatest impact on stitch gauge to size knit and purl stitches equally and achieve even tension. You'll give each finger a job, minimizing hand motions so that your knitting will become faster, more comfortable and more efficient! Whether you're new to knitting, or seasoned in English–Style, you'll be happy you took this big step. For our first lesson, we'll focus on the knit stitch — Continental style. Learn how to tension and position yarn in your hands to make knit stitches flow effortlessly across your needles, then move on to the purl stitch. I'll show you how to hold your yarn and move it into place so that your needle grabs quickly and easily, and we'll work to keep awkward movements at a minimum, making sure your stitches are correctly oriented on your needles. Depending on your stitches, you might notice that your knitting is too tight or too loose. In our third lesson, I'll show you how this happens and explain how to get those stitches just right. While you've likely gotten an idea of how Continental Knitting increases your efficiency, it's with techniques that require frequent stitch alternation where the value of this style really shines. As we talk about ribbing and seed stitch, you'll see that getting working yarn to the back or front of your knitting is simply a matter of shifting your right hand! Next, we'll walk through basic increases, decreases and other stitch maneuvers as you find out just how easy elaborate patterns become when you're holding your yarn in the left hand. That's why lefties especially will love Continental Knitting! Then, whether your favorite fabric has cables, colorwork or beyond, you'll learn how to tackle each. Just try not to get too excited when you see how much easier linen stitch and colorwork can be — we've still got one lesson to go! For our final lesson you'll face an inevitable truth: the way you're holding your yarn might be causing you pain. I'll give you tips to keep in mind so you can avoid pitfalls and pain, and troubleshoot why you may have trouble keeping tension and stitches even. We'll end on an inspiring note, and run over some small, fun projects with which you can put your exciting new skills to use! 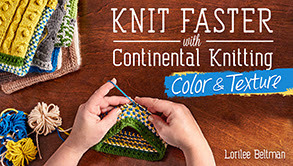 This looks like a really great class - if it had been around when I was teaching myself to knit this way, it would have saved a lot of time and problem-solving. If you haven't used them before, Craftsy classes are easy to use, are available to you forever and can be accessed on any internet-connected device but you can also download them to watch offline. You can ask questions of the teacher and other students, add notes and upload your projects. Best of all, every class is covered by a 100% no-quibble guarantee so you have nothing to lose. At the time of writing the class is on sale for £12.50 (34% off) and you can enrol here. Let me know how you get on! UPDATE: There is a further class from Lorilee, specifically for knitting with multiple colours and texture, clicking the image will take you to the class information. I tried teaching myself continental style a few months ago using some great youtube videos, and while I found I could orchestrate the knit stitch okay, the purl stitch just was so cumbersome-trying to keep my tension consistent and the movements smooth between the two stitches was really hard. My fingers are not as agile as they used to be! I suppose it's like learning any new skill....practice, practice, practice! I'm struggling with the giving each finger a different job and remembering what job I've given them hahaha! Co-ordination isn't my strongest point ;-) But persevere I will! Continental style looks like hocus pocus to me whenever I see it. I can't quite let my eyes believe what I'm seeing! I might be brave and give it a go!